Preheat oven to 450 degrees. 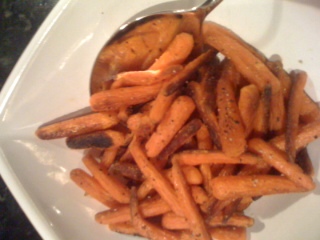 On a rimmed baking sheets, toss carrots with 2 teaspoons oil and season with salt and pepper. Roast until tender and golden, 20 minutes, tossing halfway through. In a medium bowl, combine beef, spice mix, cinnamon, cilantro, minced white and green scallions, and egg; season with salt. 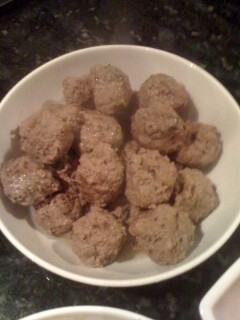 With hands, gently mix to combine and form into 16 meatballs. In a large skillet, heat 1 tablespoon oil over medium-high. 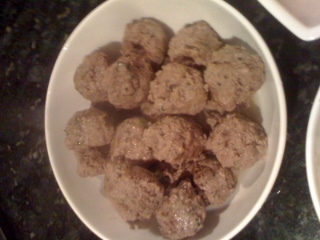 Cook meatballs until browned on all sides, about 8 minutes total. Add 1/4 cup water, cover, and reduce heat to low. Cook until meatballs are just cooked through, 5 minutes. Meanwhile, in a medium saucepan, heat 1 teaspoon oil over medium-high. Add sliced scallion whites and cook, stirring, until softened, 3 minutes. Add 1 cup water, cover, and bring to a boil. 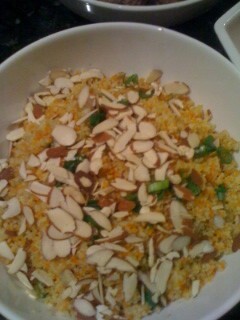 Stir in couscous and season with salt and pepper. Cover, remove pan from heat, and let stand 5 minutes. 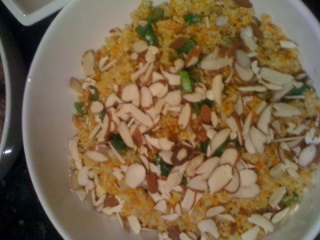 Fluff couscous with a fork and stir in almonds and sliced scallion greens. 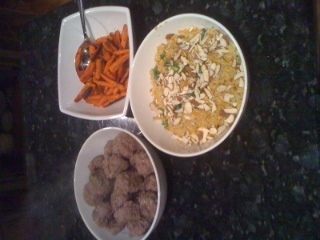 Serve meatballs and any pan juices with couscous, carrots, and lemon wedges. 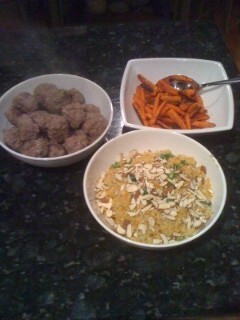 Notes: After consuming this dish, we were not fond of the meatballs. They need some work. Any suggestions are welcome! Everything else was fantastic! On a side note, I have cinnamon raisin bagel dough in the fridge! Hot damn, I can't wait until Saturday to make those suckers up! Hell, I may not even wait. I may do it on Friday! Look at me being the rebel! Of course I used the recipe that I posted in my Bagels post. The only thing I did differently was I added a cup of cinnamon chips and a cup of raisins to the dough before I mixed it up. I don't think I have to tell you not to add sesame seeds. The dough smells fantastic! Oh what a treat! I ran down stairs to grab my last bag of carrots out of the freezer and I found a little Cadbury creme egg hiding in the grocery bag! I forgot I bought that. Natalie will be excited to see it as I bought it for her. Apparently, she forgot about it too. Thanks for stopping in on this cold, blustery evening!